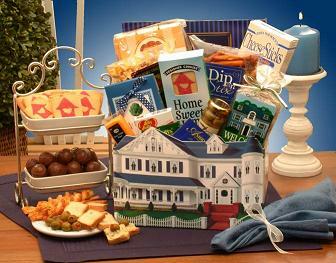 Say welcome to your new home with a Housewarming Gift Basket! Our custom tailored housewarming gift baskets are offered in a variety of designs and are accompanied by a delicious selection of gourmet treats. included with all of our Housewarming Gift Baskets! Home Is Where The Heart Is Housewarming Gift BasketHelp them to celebrate their new home in a grand way with our Home Is Where The Heart is gift basket. A classic woodchip basket makes a perfect storage bin once the goodies are all gone. A sure way for them to remember how thoughtful you were on their special day.